Boom 11,0 m to 51,0 m six section TWIN-LOCK™ boom. Maximum tip height 54,0 m.
Boom elevation 1 cylinder with safety valve, boom angle from -3° to +82°. Load moment and independent anti-two block system Load moment and independent anti-two block system with audio visual warning and control lever lock-out. ese systems provide electronic display of boom angle, length, radius, tip height, relative load moment, maximum permissible load, load indication and warning of impending two-block condition with lock-out hoist function. Cab Aluminium, tiltable (approx. 20°), full vision, safety glass, adjustable operator's seat with suspension, engine-independent heater. Armrest-integrated crane controls. Ergonomically arranged instrumentation and crane operating controls. Drive/steer controls. Slewing 2 slewing gears with axial piston motors, planetary gear, service brake and holding brake. Hydraulic system 2 separate circuits, 1 axial piston variable displacement pump (load sensing), with electronic power limiting control and 1 gear pump for slewing. ermostatically controlled oil cooler. Tank capacity: 680 l.
Control system Full electronic control of all crane movements using electrical control levers with automatic reset to zero. Integrated with the LMI and engine management system by CAN-BUS. ECOS system with graphic display. Hoist Axial piston motor with planetary gear and brake. Drum rotation indicator. Electrical system Three-phase alternator 28 V/80 A, 2 batteries 12 V/170 Ah. Optional equipment • Bi-fold swingaway, 8,7/15 m with hydraulic offset and luffing under load (0°-40°),controlled from the crane cab. • Bi-fold swingaway, 8,7/15 m (manual offset 0°, 20°, 40°). • Lattice extension, 21 m - includes 6m fixed non-offsettable section plus 8,7/15 mswingaway (see above). • Additional 10 tonnes counterweight (total counterweight 19,3 tonnes). Chassis Special 4-axle chassis, all-welded torsion-resistant box type construction in high strength steel. Outriggers 4 double hydraulically telescoping beams with vertical cylinders and outrigger pads. Independent horizontal and vertical movement control on each side of the carrier. Electronic level indicator with automatic levelling system. Engine Mercedes-Benz OM501LA, diesel, 6 cylinders, water cooled, turbocharged, 290 kW (389 HP) at 1800 rpm (80/1269 EWG - fan loose). Max. torque: 1850 Nm at 1080 rpm. Fuel tank capacity: 400 l. Engine emission: EUROMOT / EPA / CARB tier (non road). Transmission ZF-AS TRONIC automatic, 12 forward and 2 reverse speeds. Two speed transfer case with inter-axle differential lock. Axle lines 4 axle lines. 1, 3 and 4 are driven steering axle lines, the 2nd is a steering axle line. Suspension MEGATRAK®. All wheels with independent hydropneumatic suspension and hydraulic lockout. Longitudinal and transverse level control with automatic on-highway levelling system. Range +170 mm/-130 mm. Tyres 8 tyres, 385/95 R25 (14.00 R25). Steering Dual circuit, hydraulic power assisted steering with emergency steering pump. Axle lines 1, 2, and 4 steer on highway. Separate steering of the 3rd, and 4th axle line for all wheel steering and crabbing. Brakes Service brake: pneumatic dual circuit, acting on all wheels, air dryer. Anti-lock braking system (ABS). Permanent brake: exhaust brake and constant throttle brake. Parking brake: pneumatically operated spring-loaded brake acting on axle lines 2 and 4. Cab Aluminium, 2-man-design, safety glass, driver seat with pneumatic suspension, engine-dependent hot water heater. Complete instrumentation and driving controls. Electrical system ree-phase alternator 28 V/100A, 2 batteries 12 V/170 Ah. Lighting system and signals 24 V.
Optional equipment • 8 x 8 x 8. • 8 tyres, 445/95 R25 (16.00 R25) - Vehicle width 2,75 m.
• 8 tyres, 525/80 R25 (20.5 R25) - Vehicle width 3,88 m.
• Engine-independent hot water heater, with engine pre-heater. 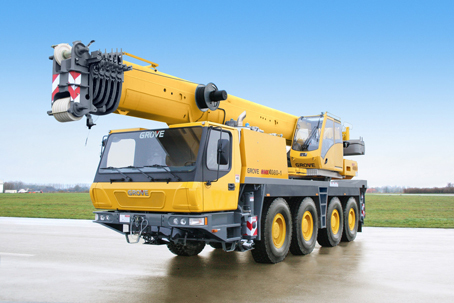 South Africa's leading mobile crane company. Distributors of Manitowoc mobile cranes. New & used cranes, parts, service, training and advice. © 2016 Crane Load Technology, All Rights Reserved.